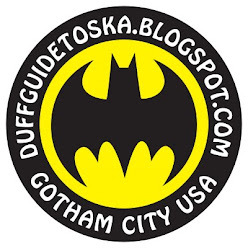 The Duff Guide to Ska: Duff Review: Tim Timbomb's "30 Pieces of Silver" b/w "Ooh La La" 7" Single! Duff Review: Tim Timbomb's "30 Pieces of Silver" b/w "Ooh La La" 7" Single! Not that I count myself amongst them, but the cool kids know that Rancid's/The Transplants' Tim Armstrong AKA Tim Timebomb has been releasing a song a day (recorded with a revolving cast of very talented musical friends) since last October. Some are originals, others are choice versions of ska, reggae, punk, rock, and country classics; there are now several hundred in all (YouTube versions of the songs go up on his site each day--each accompanied by original art by Tim on faux 7" record picture sleeves--then the digital tracks are available on iTunes a few weeks afterwards). It's kind of fascinating to see the wide range of musical styles and eras that Tim clearly respects and digs--this whole endeavor is a bit like him rummaging through his collection of 45s with us, and pulling out and playing his favorite tracks that we've just gotta hear. Of this ever-growing collection, ska and reggae fans will want to check out Tim Timebomb and Friends' covers of The Specials' "Concrete Jungle," The Bodysnatchers' "Let's Do the Rocksteady," Bad Manners' "Lip Up Fatty," The Selecter's "Too Much Pressure," The Beat's "Save It for Later," Jimmy Cliff's and Tim Timebomb's "Children's Bread," and a really great 2 Tone-ish take on The Ethiopians' "From Bad to Worse" (I'd love to see this last song come out on vinyl). 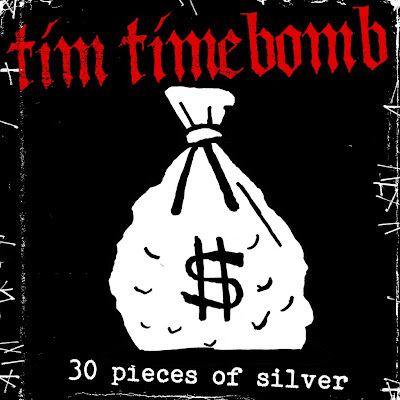 Since I'm into music issued on tangible formats, I'm reviewing Tim Timebomb's newly released "30 Pieces of Silver" single. The terrific A side is a faithful, vintage ska rendition of this Prince Buster classic, though Tim's ragged vocals convey the resigned anger and frustration over an associate's betrayal in a manner that's almost better than the original. According to reggae expert Brian Keyo, Buster's bile is "directed at Lloyd Charmers, whose group, The Charmers, recorded for other producers during Buster's 1963 trip to England." Of course, this song's title refers to the bribe of the aforementioned number of silver coins received by Judas Iscariot for betraying Jesus (Judas was one of Jesus' twelve apostles). Judas' kiss identified Jesus to the forces of High Priest Caiaphas, who arrested him and turned him over to the Romans for trial. Pontius Pilate soon had Jesus executed on the cross, since he was seen as a threat to the legitimacy of the Jewish high priests and as a potential revolutionary leader by the Roman occupiers (out of remorse, Judas hanged himself). So, this track is reserved for publicly shaming someone close who really screwed you over badly (though, interestingly enough, for Prince Buster, this was more of a transactional than emotional betrayal: "The shirts you wore, I bought them/The shoes you wore, I bought them/The pants you wore, I bought them/Judas Charmer is your name/So hear them call you Judas..."). Side B is an excellent ska cover of The Faces' 1973 song "Ooh La La", a somewhat misogynist and cynical view of women and love that's also full of regret about the fact that sometimes knowledge is only gained through age and experience (and not necessarily in your head at a time in your life when you need it the most): "The Can Can's such a pretty show/They'll steal your heart away/But backstage, back on earth again/The dressing rooms are grey/They come on strong and it ain't too long/Before they make you feel a man/But love is blind and you soon will find/You're just a boy again/When you want her lips, you get a cheek/Makes you wonder where you are/If you want some more and she's fast asleep/Then she's twinkling with the stars/Poor young grandson, there's nothing I can say/You'll have to learn, just like me/And that's the hardest way/I wish that I knew what I know now/When I was younger..." When Tim sings/speaks the chorus ("I wish that I knew..."), you believe him. Traditional ska fans shouldn't be put off by Tim Timebomb's punk pedigree (Rancid's take on ska and reggae via The Clash has always been good to great--and do I even need to remind you of Op Ivy?) --these two cuts are the real deal and highly recommended. "Judas Charmer is your name" is the lyric and its directed at Lloyd Charmers, whose group, The Charmers, recorded for other producers during Buster's 1963 trip to England. Thanks so much for this bit of info (and the correction), Brian! I'll update the post and give you credit.